I really like Almond Joys. A lot. In fact, when Halloween rolls around every year, I hoard the Almond Joys as if the Great Depression was to happen within the next five minutes and there’d be a sudden interest in all of the Almond Joys. No one in my family likes Almond Joys that much to where they become psycho over them and count how many they have, eager to know that if they eat one, it will only slightly diminish the supply. So when I found this GENIUS post from the oh-so amazing Kristan from Confessions of a Cookbook Queen, I absolutely had to try it. And promptly hoard the whole supply. So what if it makes 36? I want them all. Here’s the recipe, exactly like hers. Make these now–then check her stuff out. She has me on a coconut craze right now. Next, I’m making her Samoas Truffles. By next Friday, I will be obese… and I’m okay with that. 1. Preheat oven according to brownie mix instructions, and prepare mix according to package directions. Lightly grease a mini muffin pan. Using a small cookie-dough scoop, portion out batter into muffin tins, filling about halfway to 3/4s way full. Bake according to package directions (mine baked for about 16 minutes). Cool completely. 2. In a medium bowl, combine the milk and coconut. Using clean hands, roll small balls of coconut mixture in the palm of your hand and press down gently into tops of cooled brownie bites. Press a whole almond into the top of the coconut mix. Freeze brownie bites for about 15 minutes to harden the coconut. 3. Melt chocolate bark according to package instructions. Dip tops of brownie bites into chocolate and place on wax-paper lined baking sheet or back into their muffin tin slots. Refrigerate until chocolate has hardened. 4. Promptly hoard and consume one by one, preferably with a tall glass of milk. 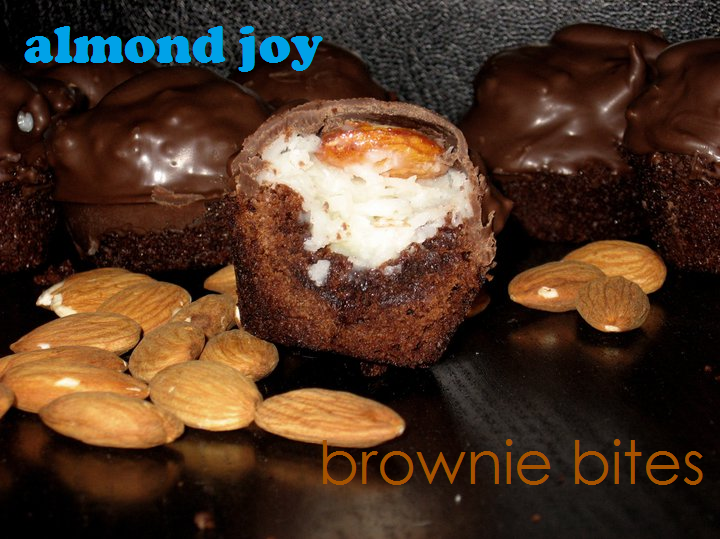 These brownie bites are simply amazing. The sweetened coconut, the yummy chocolate and the crunchy almond–awesome. as much as I love almond joys – I’m not really sure how I actually missed this the first time around, but I did – however, I will be making these this weekend……all for me! These are incredible! Yum, yum, yum! I made them to take to work tomorrow but they may not make it. My partner keeps taking one each time he walks past them.